Kill. Die young. That’s what a swordsman bonded to the ancient gods does. Without expecting praise from the man who trained him to survive this centuries-old, malignant war against the inhuman followers of an invincible lord. But Kaell wants more. More of Val Arques’ attention, his approval. Just more. Ice lord, spy, Heath never loses a fire dance. Yet he longs to know that thrill of danger down his spine as he kills for his god, to fight a warrior who might, just might be better than him. Val Arques is a bladesman of formidable power entrusted not only with Kaell’s life but with the truth that will destroy him. Banished to a grim outpost of this doomed kingdom of sorcery, poetry and treachery, he cannot afford to care about the young warrior. As a vengeful god escapes his ancient prison and Kaell is drawn into his web of deception, even Val Arques can’t protect him from the dark prophecy awaiting him. Because you can’t flee fate unless you’re willing to do the unthinkable. Duty and love collide in this powerful epic fantasy about shattering loss, betrayal and the price of power that will enthral fans of Game of Thrones, Blood Song and the Mistborn trilogy. If you love dark plots, dark magic and characters with even darker secrets; pick up The 19th Bladesman, first in the sensational Shadow Sword series. I finished this book in a weekend! I’ve been waiting for a new fantasy novel that gives me a “I can’t put this down until I finish reading” feeling. The 19th Bladesman was un-put-downable. The story line told from alternating points-of-view kept me intrigued from the start. Each of the characters have a complexity about them and couldn’t help but love Kaell and Val. So much love for Kaell! I’ve recommended this book to a few friends already, and so far they’re enjoying it as much as I did. I can’t wait to find out what happens next. Hopefully it’s not too long until the next book comes out. 5.0 out of 5 starsEpic! The author has built a rich world, full of magic and well written characters. You are taken on a journey with multiple POVs, action, drama, plot twists and will meet many amazing characters, some with honour and well some not so honourable. This is a book best read when life will not get in the way. 3.0 out of 5 starsInteresting new world but the characters were a little lacking. First thing that comes to mind is that this is a long read! Usually I can finish a book in a few hours but this took a bit to get through for me. It’s a good book, but I sometimes struggle with trying to decipher who is a good guy and who is a bad guy, and the reasoning for the blurred lines. I think anyone who is into the sorcery type of fantasy reads would really enjoy this book regardless. I do wish the characters were a little more personable, I like a great read where I can find a character that I can truly relate to and really pull for in the story. I didn’t really find that in any of these characters. Aside from that, the world the author created was interesting and I feel like they added a different twist to the story from your traditional otherworldly fantasy novel. 5.0 out of 5 starsWhat an epic fantasy! This is hands down a riveting first novel in what promises to be an excellent series! Author S.J. Hartland weaves an epic fantasy that hits all of the right chords: compelling characters; intriguing antagonists; a deeply built, sprawling world; mysticism and magic; prophecies; among others. Almost immediately I was drawn in by Hartland’s story-telling. Her way with words is rare, how she tantalizingly teases the reader into reading just another page before she turns up the action. It’s a perfect mix of emotion and description without falling too much on either side. I look forward to reading the second novel which comes out in May - The Last Seer King. I don’t want to give too much away of the plot, but Kaell, a young boy, is doomed to die. But, as usually happens in great fantasy novels, the gods have different plans for him. You’ll be pulled into a magical tale that’s on par with some of the best mainstream fantasy novels out there. You won’t regret reading this. A fantasy tale about: Kings, wars, warriors, duty, power, love and allegiance; this book is as much adventurous as it is magical. The story follows a young man, destined by fate and cursed by magic, who must sacrifice his own life and blood to fulfill his duty to his Kingdom and to “the gods.” Potions, dark magic, curses, and mystical visions re-occur throughout the story and often foreshadow what the reader can expect next. Mystical, psychic-like visions are described with great detail and vividness- allowing the reader to sense every aspect of this story’s magic. With both skill and delicacy, the author managed to invoke feelings of empathy within me. I frequently found myself wanting to comfort the story’s leading character- despite his arrogance, brashness, and stubborn-like need to engage in violence. The author does a commendable job creating a fictional world filled with magic, casualty, and war; and she describes this world skillfully, allowing the reader to feel as though we are also a part of this fantasy dimension. However, I would like to caution that for me, the book was a bit difficult to read at times for various reasons. I found that the story lagged behind on several occasions- several pages were spent solely describing scenery instead of actually telling the story and advancing the book’s plot. Additionally, it takes a while to get to the overarching plot and conflict of the book; there is quite a bit of build up before the reader begins to figure out what is happening in the book. Last, there are several different characters and stories all being introduced sporadically throughout the book. Thus, sometimes it is difficult to follow along with who is at war with who, who has battled who, who is who’s father/son, and so forth. That being said, if/when you are able keep track of the various character’s and their conflicting story lines- you will find this story thrilling, as it is full of fantasy, creativity, and suspense! All in all, I think this story would likely make an exciting and stunning movie. However, if you have difficulty keeping track of multiple moving parts, concentrating on one thing for an extended period of time, or you do not normally read for leisure, you may find it a bit difficult to parse through this piece. 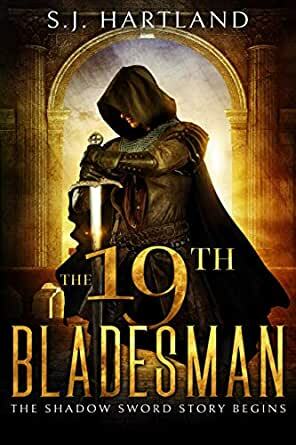 The 19th Bladesman (Shadow Sword series Book 1) by S. J. Hartland is the author's first book, but don't let that deter you from reading this gem. This is a fantastic fantasy book with sorcery, magic, and a certain darkness. The characters are deep and sometimes hard to relate to, but perhaps that is part of the story building process here. It's hard to know who is a bad guy vs. who is a good character. They are all intriguing however. The names are great as well, Vraymorg, Rozzen, Kaell, among others. Nonetheless the author has built a compelling fantasy world, and pulls you in right from the start. There are a lot of elements here from battles and spies, to mysticism and various secrets. Battles galore, castles, and everything else you can imagine inhabit this complex book. Perhaps a list of characters in the front of the book would be helpful so that the reader could keep track of things would be helpful. Otherwise, a solid entry into the fantasy genre. Highly recommend. The 19th Bladesman is a book about heroes, heroism, duty, and honors. There are also evilness, deceptions, manipulations, love, romance, and other emotions. We have a not-so-good king who misuses his powers for the wrong things. A lord of the mountains who is duty bound to serve the king even if things go against him and several heroes with their own individual qualities. In the midst of all, there is this young boy raised by the lord of the mountains who craves the Lord's praises and wants to be loved and approved by him. The boy knows that he is condemned and so shy away from any relationship. The book is long and transports you into a different place and time. There are ghouls, magic, sorcery, and of course heroism that duty bounds people and drowns out their natural instinct to love. The book touches your heart and leaves a lingering pain. There are many characters and heroes and each has been given their space to grow and become familiar with the readers. There are very few proofreading mistakes but these can be ignored. In fact, the book reads like an epic with hints for more action and heroism in its sequel. There are still some questions unanswered and mystery unresolved.